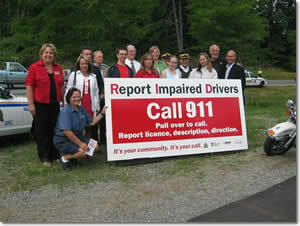 Report impaired driving. Call 911. Impaired driving is the #1 cause of criminal death in Canada and, yet, every impaired driving crash is preventable. By calling 911 and reporting suspected impaired drivers to police, all Canadians can play a role in keeping our roads and waterways safe and in reducing impaired driving crashes, deaths and injuries. Join Campaign 911 today! Contact MADD Canada and review our campaign materials to learn how. ALWAYS MAINTAIN A SAFE DISTANCE FROM ANY DRIVER YOU SUSPECT MIGHT BE IMPAIRED. ALWAYS WEAR YOUR SEATBELT. Please observe all safety rules. Keep your distance from the impaired driver. Use extreme caution when using a cellular phone to call 911. Police officers are trained specialists, let them do their job. Never try to apprehend the impaired driver yourself.